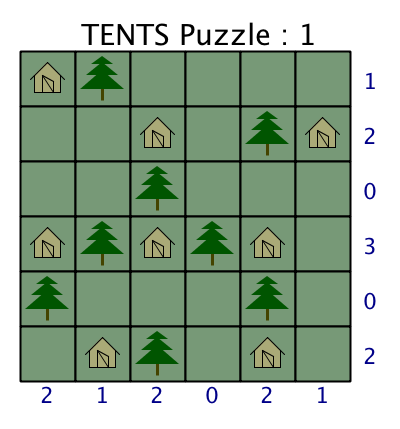 A Tents puzzle consists of a square or rectangular array of squares in which some of the squares contain a tree, with the remainder containing only grass. The puzzle is solved by placing tents into selected grassy squares so that each tree has its own tent (either horizontally or vertically), and each tent has its own tree (either horizontally or vertically). The squares in which tents are placed must not touch on either the sides or the corners. Numbers located to the side and to the bottom of the puzzle tell you how many tents are in each row and column. 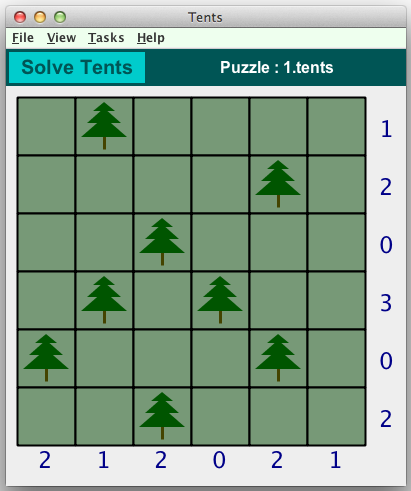 These graphics show a Tents puzzle in the Crossword Express Solve screen and a PNG graphic file produced by the program's print function, showing the complete puzzle solution. See also a full size version of a PDF file. Fully automatic construction of puzzles. Puzzle sizes can range from a minimum of 5x5 up to a maximum of 10x10.